Admittedly the change of nails was more because I fancied it rather than them needing to be done. 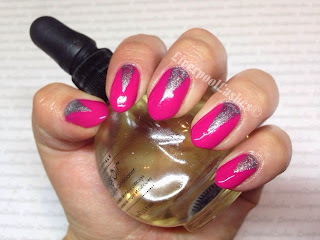 I enjoyed my New Years nails but I wanted something brighter on them so I choose CND Shellac in Pink Bikini. I think mixed a little Lecente Stardust in Galaxy with a little bit of Shellac Top Coat and drew on the slices in the centre of each nail. I love how bright but slightly fierce these are! !